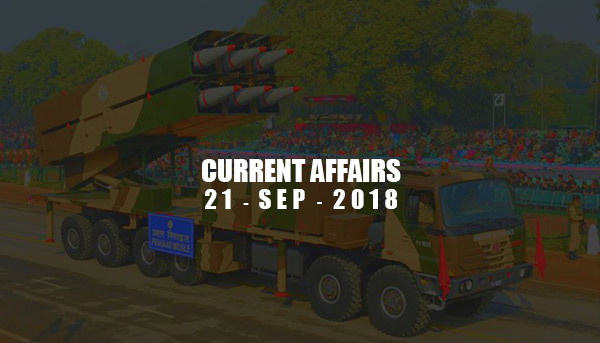 Current Affairs - Sep 21, 2018 - IAS - Daily Current Affairs, IAS Syllabus Exam Strategy, IAS Preparation. Virat Kohli and Mirabai Chanu are selected to be awarded Rajiv Gandhi Khel Ratna. Virat Kohli is currently Indian cricket captain and Mirabai Chanu is a weightlifter to receive the prestigious award September 25, 2018. Chanu was chosen for the prestigious award following her gold medal in the 48kg category at the World Championships 2017. Rajiv Gandhi Khel Ratna is the highest sporting honour of India. Javelin thrower Neeraj Chopra was among 20 sportspersons picked for the Arjuna Awards. Indian Space Research Organization (ISRO) is about to set up this state-of-the-art facility in Ministry of Home Affairs. ICR-ER will address the requirement of receipt of information on near real-time basis, strategic level monitoring, situation awareness, command and control, preparedness and response in the diverse internal security situation and disaster-related emergencies. Resultantly, it will increase the operational effectiveness and will be helpful in rendering timely response/assistance during various emergency situations. The ISRO Technology Incubation Centre has been launched in Agartala. The Centre was launched at the first edition of ‘Spacetronics’ organized by the India Electronics and Semiconductor Association. The Incubation Centre is located at National Institute of Technology Agartala. On the launch event K. Sivan said that ISRO is looking to incubate space-related innovation and start-ups. Prahaar is a solid-fuel road-mobile surface-to-surface tactical missile. It is a contemporary weapon system capable of carrying multiple types of warheads and neutralizing a wide variety of targets. India successfully test-fired this indigenously developed ballistic missile on 20 September 2018. ‘Prahaar‘ has been developed by the Defence Research and Development Organisation (DRDO). The missile is equipped with state-of-the-art navigation, guidance and electromechanical actuation systems with the advanced onboard computer. Its operating range is 150 km, and flight altitude is 35 km. Home Minister Rajnath Singh launched India’s first ever online and centralised National Database on Sexual Offenders (NDSO) in New Delhi. The database will have a record of the name, photographs, address, fingerprint and other details of convicted offenders.